It’s been just over a month since we opened our doors for the very first time and welcomed an absolutely amazing group of people into our beautiful space. Thank you to all of you who made it, I wholeheartedly appreciate your support, well wishes and amazing energy. The absolutely brilliant team, Ben and Clare delighted us with their gorgeous Raw Cacoa ceremonial drink reception and sent us into a blissful dreamland with their Gong, singing bowl and wonderful array of instruments. The experience encapsulated exactly how I wanted to launch my brand new business, in a way which was unique and totally mind blowing, and Ben and Clare were amazing and did it perfectly! If you’ve never been to a sound bath before, this is something that every one should experience at least once in their life time. I’d only ever experienced sound healing at part of relaxation, yoga nidra or guided meditations so this was a new experience for me, and something I am now a huge fan of. 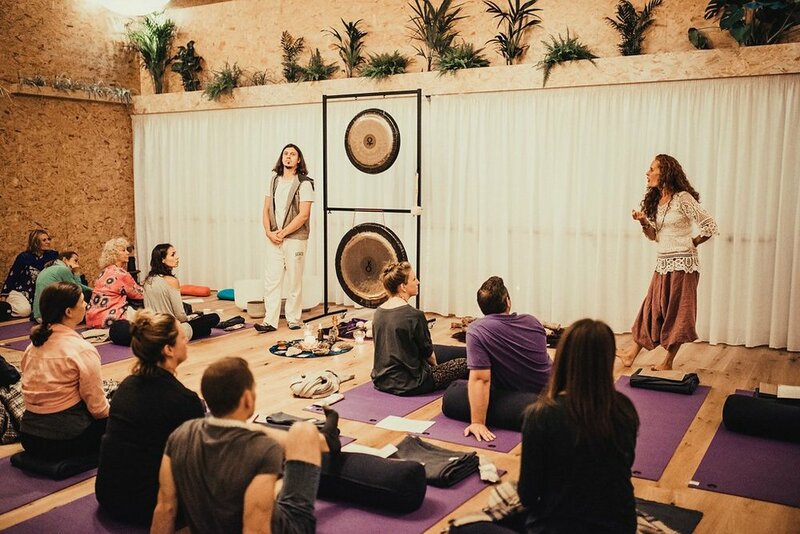 My experience at this Gong Bath was seriously deep, the vibrations totally overwhelmed my senses in a way that was not at all frightening or unpleasant, it was all consuming and totally welcome. I came away feeling a sense of completeness, release, having been healed deeply - right into the cells of my body, and relaxed to the point of hardly being able to speak! Clare is an absolute expert at her guided journey down into deep relaxation with her beautiful tone, powerful voice and words filled with wisdom and experience. The alchemy of instruments was incredible. That night I had the longest and deepest stretch of sleep than I’d had in over a year and I cannot wait to enjoy these feeling again when Ben and Clare join us again next month. If you’d like to join us tickets are now available on our website for Saturday 10th November, staring at 7pm with Raw Cacao drink reception, £30 (inc. Cacao drink).